Rudbeckia laciniata, the tall coneflower, cut leaf coneflower, or green-headed coneflower, is one of the tallest Rudbeckias. 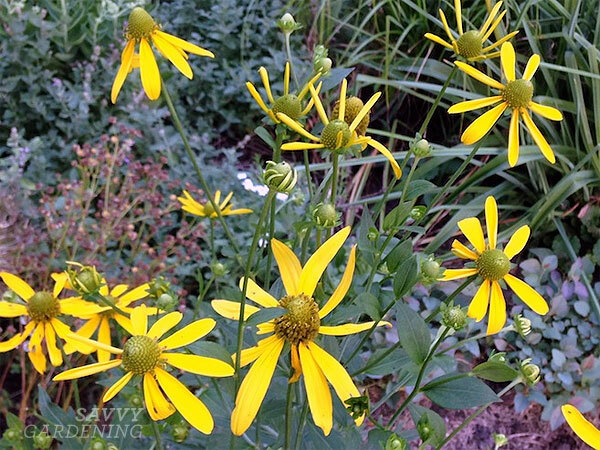 Topping out between three and twelve feet, cut leaf coneflower has divided leaves and four-inch wide flowers that have green, cone-shaped centers and yellow, downward curved petals. It is native to nearly all of North America. I grow mine in the back of my perennial border where it can stand watch over all the other plants I have growing there. Rudbeckia fulgida, the orange coneflower or black-eyed Susan, is a broad-ranging eastern native that has become a ubiquitous garden species. It has many varieties and cultivars. The yellow-orange petals and dark central disks are produced on plants reaching one to three feet tall. The leaves have fine, bristly hairs. The only trouble I face with this plant is its tendency to develop leaf spot during wet seasons. This fungal disease creates dark blemishes on the foliage, but doesn’t seem to affect the flowering. Because of this aesthetic issue, I’ve removed this plant in all but two areas of my garden and replaced it with other Rudbeckias that are less prone to developing leaf spot. Rudbeckia hirta (shown in the main image above), annual black-eyed Susans, are often treated as annuals or biennials in the landscape. They reach one to two feet tall and have very hairy leaves and coarse stems. There are many varieties and cultivars of this species; some bearing yellow petals while others have petals with various combinations of burgundy, orange, brown, and yellow. There are double-petaled forms as well. My personal favorites include ‘Irish Eyes’, with its green center, and ‘Indian Summer‘, with its bright yellow petals. Rudbeckia triloba, brown-eyed Susans or thin-leaved coneflowers, are an eastern and southern species. Of all the Rudbeckias, triloba is my absolute favorite. The basal leaves of this plant are often trifoliate (meaning they are comprised of three leaflets joined together). The plants are multi-branched and reach two to three feet in height, lending a dense, bushy appearance to the plant. Each flower measures an inch or so across, and the entire plant is completely smothered in flowers by late summer. Though R. triloba is considered a short lived perennial in most areas, it is totally worth growing. I will not garden without it! Rudbeckia subtomentosa ‘Little Henry’, is a short-statured form of the tall ‘Henry Eilers’ rudbeckia. This quill-petaled variety is probably the most unique rudbeckia on the market. While ‘Henry Eilers’ reaches up to 8 feet tall, ‘Little Henry’ tops out at just 18-24 inches. Both are stunning plants for the garden, with late-season blooms and eye-caching good looks! The spoon-shaped petals of ‘Henry Eilers’ and ‘Little Henry’ rudbeckias are so unique! 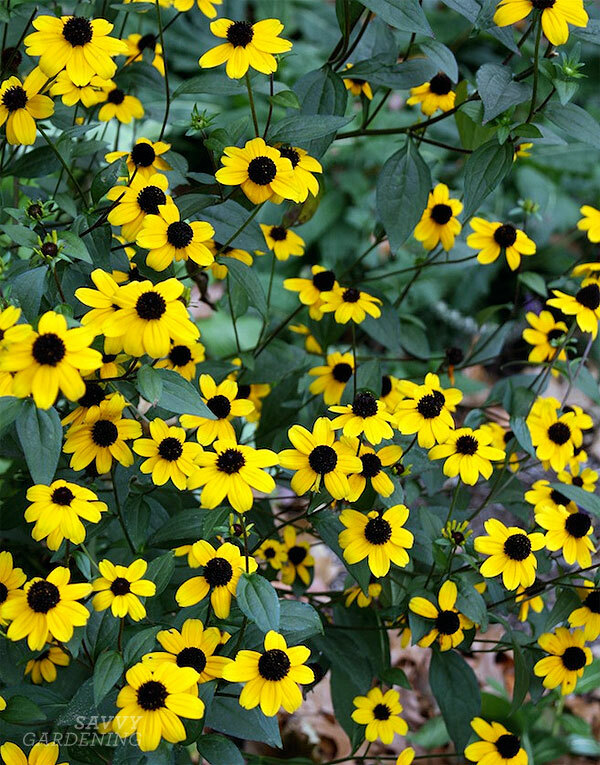 No matter which types of rudbeckia you decide to grow, they’ll all bring great color and much joy to your garden. 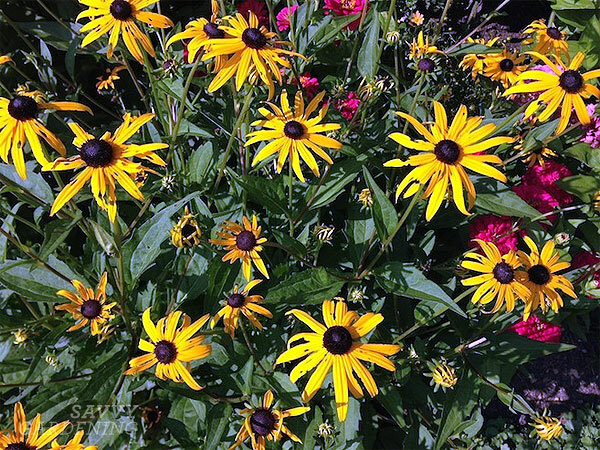 Do you have a favorite Rudbeckia variety? Tell us about it! 3 Responses to Rudbeckias: Powerhouse plants! Beautiful photos! Probably the Giant Coneflower – Rudbeckia maxima – is my favorite, just because it is so unusual and so very tall. But I really like all Rudbeckias, and you can’t beat their hardiness. Ooh, this is such an interesting one! Now if I could just stop Peter Rabbit from chewing mine down to the ground. No amount of Plantskydd seems to deter him/her. sigh…..